Known Donor Family Law New York is changing. Many lesbian couples look to known donor family law New York prior to choosing known donors to help them have their families. In my legal practice, I have seen this number increase steadily over the last 10 years. Reasons for choosing a known donor include giving children a link to their biological heritage, having access to specific medical histories and providing male influences in the lives of children born into these progressive families. The law appears to be coalescing in favor of intended mothers and a recent Appellate Division case moves known donor family law in New York further in that direction. Before discussing the new case, let me give you a brief history of existing known donor family law in New York. Brooklyn Family Court Judicial Hearing Officer (JHO) Harold Ross, in a decision titled The Matter of L., et. al, held that as long as uncertainty exists for LGBT couples who create their families with assisted reproductive technology (ART), with both anonymous and known donors, then second parent adoptions are the best way to secure those families from this uncertainty. In the Matter of Brooke S.B. v. Elizabeth A. C.C., a landmark decision released in August of 2016, the New York’s highest court overturned previous New York precedent that had torn families apart for decades and ruled that non-biological and non-adoptive parents did have standing to sue for custody and visitation in the New York family court system. While this case did not specifically address the issue of a known donor’s rights to a child he helped come to be, it brought New York family law in line with many other states which recognize “de facto” parents for the purpose of custody and visitation and prioritizes the best interests of the child in making these critical decisions. This new known donor case, entitled In the Matter of Christopher YY v. Jessica ZZ and Nicole ZZ, New York’s Appellate Division, Third Department (whose jurisdiction covers matters derived in South Central New York State to North Eastern and Central Eastern Counties in New York) addressed the issue of a known donor who sought to have a paternity test ordered by a family court. The family court agreed with the donor and ordered the testing. The mothers filed an appeal and the result of that appeal was to overturn the lower family court’s decision to order paternity testing for two reasons, thus codifying new known donor family law in New York. The first reason was the marital status of the mothers. They were married when they planned on having the child and they had an informal agreement (one drafted and executed without the benefit of legal counsel) with their donor, something that all intended mothers should have with their known donor prior to insemination. The court stated that there existed a “presumption of legitimacy of a child born to a married woman.” Even if this presumption exists, the court must conduct a “best interests of the child” analysis before any paternity testing can be ordered. The key question is whether the paternity testing is in the best interests of a child. 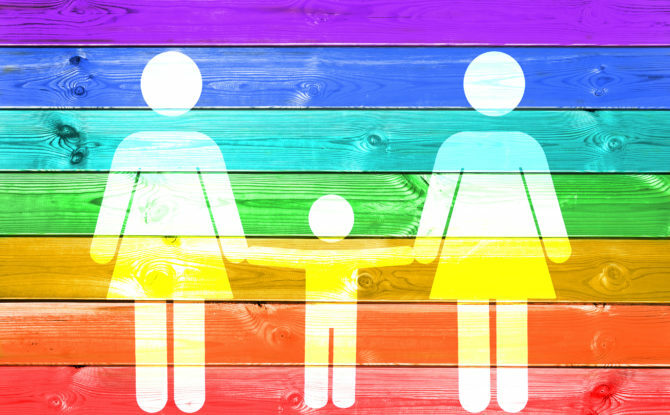 The court determined that the presumption existed regardless of the gender of the parents, a huge statement of support for lesbian couples across New York. However, that presumption can be “rebutted” by a donor in certain circumstances. The court looked at the facts of this case, the existence of an agreement in which the donor stated that he would not seek paternity, and the lack of a significant relationship between the donor and the child after the child’s birth. To determine whether the presumption of parentage that the court established for the non-birth mother could be rebutted, they applied the concept of “equitable estoppel,” which bars a legal claim by a party if that claim is inconsistent with a prior position taken by them and relied upon by the other party. In this case, the prior position was outlined in the known donor agreement he signed with the mothers, that he would not attempt to establish paternity, and his lack of a relationship with the child after her birth. Equitable estoppel prevented the known donor from proving to the court that the paternity testing was in the best interest of the child. What does this case mean for Known Donor Family Law New York? This case is certainly a step in the right direction. But these cases are fact specific and unless there is a legal instrument, such as a step or second parent adoption order, the possibility of taking a party to court will always be a financially and emotionally time-consuming specter over a family. Another benefit of a step or second parent adoption is that is clearly and indisputably terminates the rights of a known donor, making a claim such as the one made by the donor in this case, a nullity. Known Donor Family Law New York is moving in the right direction. If you are considering a known donor, you must also consider how best to secure your family from unwanted paternity or visitation suits. For answers to your questions, please contact Anthony M. Brown at anthony@timeforfamilies.com or visit www.timeforfamilies.com.